Phew! Hasn’t it been hot? Would it deter me from continuing my parkrun tour? Absolutely not! Today I was on my way to Mole Valley parkrun. The Mole is a river - it’s name is believed to originate from the Latin word ‘mola’ meaning ‘mill’. It bubbles to the surface in mid Sussex, near to Gatwick, and then meanders northwards through the middle part of Surrey until it joins the Thames near Hampton Court. Along the way it passes through major towns such as Dorking and Leatherhead and past well known beauty spots such as Box Hill. This is a part of the country which, when people carry out those surveys as to which parts of the UK have the most prosperity or best quality of life, usually comes near the top of the list. About half way on its course the river passes through a gap in the North Downs, where you’ll find Dorking and Box Hill and, on the facing slopes, Denbies Wine Estate, the largest vineyard in the UK. Britain has a surprising long tradition in wine making. Vines were introduced by the Romans and well into the Middle Ages much of the wine consumed in the UK was produced locally. At the time of Henry VIII there were 139 recorded vineyards in Britain. But then the industry seemed to largely die out as Britons started obtaining their wines from France, Spain, Germany and elsewhere. Not until well into the twentieth century did vineyards start to reappear in the UK. The wine industry is one one of the few areas of British agriculture that is actually flourishing and expanding these days. The long hot summer has encouraged British producers to believe that they might surpass the yearly output of six million bottles. This is small change compared to what the big players like France and Italy produce but nonetheless the numbers are increasing. British wine is often of good quality and has won international awards. Denbies derives its name from one of the original owners of the land - a certain John Denby. In the mid eighteenth century the land was acquired by one Jonathon Tyers who built a country house here and redesigned the gardens with a macabre ‘Memento Mori’ theme. In the mid nineteenth century the master builder Thomas Cubitt acquired the land and built a 100 room mansion here. In the second world war the building was recquisitioned by the military and it was eventually demolished in 1953 after which the Cubitt family sold off the remaining land to Biwater, a water treatment company. 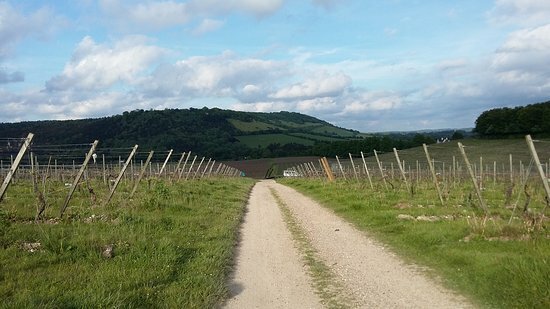 The chairman of Biwater, Adrian White, came up with the novel idea of establishing a vineyard on the slopes of the North Downs. The project turned out to be a great success. 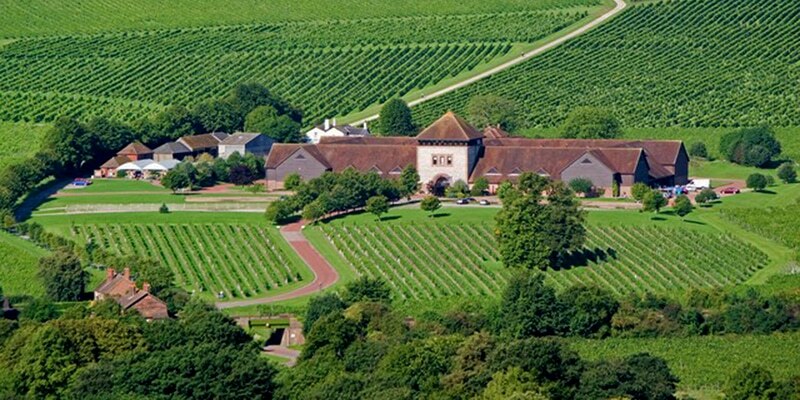 The vineyard is now the largest in the UK and produces some of the best wines. Denbies nowadays also markets itself as a visitor attraction. You can come here and take a little ride round the grounds in a land train. The visitor centre offers facilities for weddings, parties and business functions. You can even stay here overnight as they offer a bed and breakfast package. 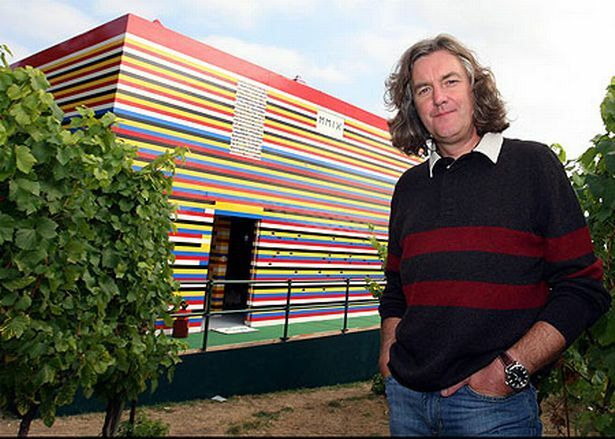 A few years ago James May, for one of his TV programmes, built a full sized house out of Lego bricks here. It subsequently had to be dismantled as they didn’t have planning permission, which is a pity. I would have liked to have seen that! The parkrun course starts down in a field alongside the visitor centre. You start with a loop around the field and then are directed up quite a testing climb up to the highest point of the vineyard. You turn left and have a few hundred yards respite as the course is slightly downhill. But then it’s a long uphill drag to the furthest part of the vineyard. You then turn back down the main track and most of the rest of the route is downhill. You also get a nice view of Box Hill. The finish is back in the field where you started. Mole Valley parkrun has proved popular in its short existence, regularly attracting two to three hundred starters (255 today) The weather today was bright and sunny though thankfully the downpours of Friday had reduced the heat and humidity. So off we went. I didn’t particularly enjoy the first field - it was a bit too bumpy for my liking. Leaving the field I was about fifteenth but gradually worked my way through the field on the long uphill climb. By the turnaround point I was on my own in seventh. The latter part of the course was quite fast as it was mostly downhill and, by now, we also had the wind behind us but I coudn’t make up any more places. I crossed the line in 20:52 which gave me seventh place. I was happy enough with that. It was a testing course - I’d have been a good minute faster on a flatter circuit. My statistics for today - that was parkrun venue number 171. I was first in my age group and third overall on age graded scores. Denbies turned out to be one of the most scenic places I have visited on my parkrun tour and I’d recommend a visit to anyone. In fact I might go back for a simple visit without the need to run up that hill! If you would like a quick look at the Mole Valley course, here is a YouTube video from an earlier event.